A subatomic particle is defined as a particle that is smaller in magnitude than an atom. The list of subatomic particles has been growing steadily since the discovery of the electron in the late 1800s resulting in the need for new fields of study. Moreover, the introduction of the photon, originally theorized by Albert Einstein, bolstered the growth of modern physics. Subatomic particles are crucial to the study of modern physics, but they are also critical to the field of quantum mechanics, a necessary branch of physics, which, coupled together with particle physics and nuclear physics, helps to illuminate the reasons as to why certain particles behave as they do. Each of these divisions are necessary given that the laws of classical physics do not accurately describe the behavior of elementary particles. The rapid expansion of the study of subatomic space resulted in the creation of a model, The Standard Model of Elementary Particles, in the late 1900s to organize the particles by their behaviors. There are two categories of subatomic particles – elementary particles and composite particles. Leptons – a category of elementary particle that compose the lightest subatomic particles. These interact using the weak force, one of four the fundamental forces of the universe. They are one of the two basic building blocks of matter. Particle physics defines six flavors, or varieties, of leptons: electrons, muons, tauons, and their neutrino counterparts – the electron neutrinos, muon neutrinos and tauon neutrinos. Muons and tauons are far more massive than electrons. Quarks – a category of elementary particle that composes baryons, or “heavy” subatomic particles, such as protons and neutrons. These baryons are created through the bonding of quarks according to the strong force, one of the four fundamental forces that act between subatomic particles. Quarks are the second of the basic building blocks of matter. There are six flavors of quarks: up and down, top and bottom, strange and charm. Gauge Bosons – a category of elementary particle that are designated as force carriers, or messenger particles that give rise to forces between other particles. They are defined as mesons, the “middle-weight” subatomic particles. Gauge bosons govern three of the four fundamental forces – electromagnetic, weak and strong. 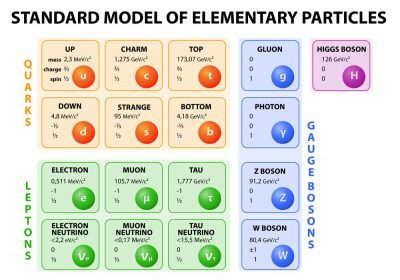 There are four flavors of gauge boson: the photon, which is the carrier for the electromagnetic field, the W and Z bosons, which are the carriers for the weak force, and the gluon, which is the carrier for the strong force. Higgs Boson – the most recently discovered elementary particle. Before its discovery, it was theorized that some field – dubbed a Higgs field – was responsible for “giving” massless particles mass by slowing down particles moving a light speed. This is shown through Einstein’s mass-energy equation, E = mc2, where c is the speed of light, E is energy and is the mass. Mass, in this equation, is given by E/c2; slowing down the speed of light, increases mass. The method of getting those massless particles to the field – named the Higgs field – required some force carrier, which was discovered to be the Higgs Boson. Composite particles are the result of binding between two or more elementary particles. These particles include hadrons, which all experience the strong force. Baryons, which contain quarks, are a part of these. There are also mesons, which contain quarks and their antimatter counterpart antiquarks. Due to the annihilation that occurs between the antimatter and matter, mesons are incredibly unstable. On the other hand, baryons, which compose protons and neutrons, are far more stable. In spite of that, baryons eventually face radioactive beta decay, where all “up” species of quarks turn “down” and vice versa. Simply stated, protons eventually change into neutrons or neutrons eventually change into protons. Out of all of these subatomic particles, there are three main particles of interest – the electrons, protons and neutrons. These are the subatomic particles that make up the building blocks of the universe – atoms. The difference between atoms is found in the numbers of each of these particles. Hydrogen, the most abundant element in the universe, includes only one proton, one neutron and one electron in its standard state. This means that hydrogen has a net charge of zero, since a proton is a positive charge and an electron is a negative charge. But not all atoms fit the standard mold. Some atoms are isotopes, meaning that they are equal in proton number, but not in neutron number. 1. What, when coupled with nuclear physics and particle physics, helps explain the behavior of all subatomic particles? 2. What is the elementary particle within an atom? 3. The construction of an atom requires leptons, quarks and gauge bosons. What do gauge bosons do for an atom? A. They bring together the elementary particles by using strong forces. B. They repel unneeded forces from the electrons, neutrons, and protons. C. They determine the charges of all elementary and composite particles.